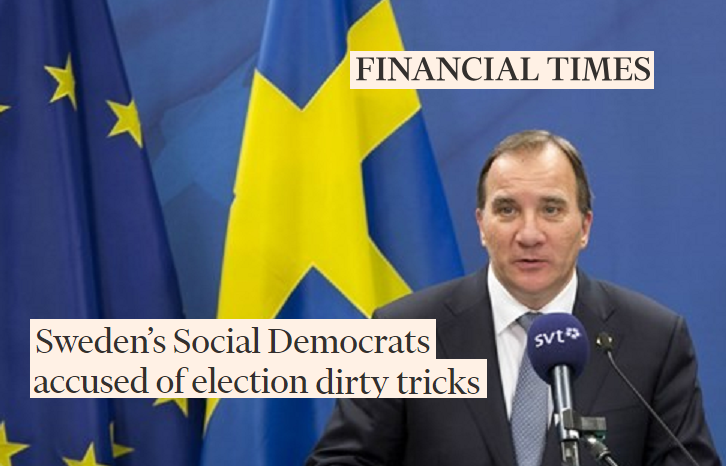 It’s full on panic for the ruling Sweden Social Democrats of Prime Minister Stefan Lofven after several of his party members were forced to resign today, having been caught spreading lies about their right-wing rivals the Sweden Democrats (the anti-immigration, anti-Europe party) who had, ironically, complained about it to the international election observers sent to make sure that the Swedish elections were conducted fairly. Social media post by left-wing candidates in at least five Swedish cities said falsely that the centre-right and right-wing parties (who are leading all polls) would separate Muslim parents from their children and wanted to remove citizenship from anybody who arrived in the country after 1970. It would seem the liberal-socialist ruling order of Sweden is willing to go to any length to win as they realize that many of them will be forced out of a job after decades in power. Related coverage: <a href="https://thegoldwater.com/news/35670-Sweden-Right-Wing-Candidates-Attacked-During-Election-Rally-Arsons-Continue-Video"> Sweden - Right-Wing Candidates Attacked During Election Rally, Arsons Continue (Video)</a>. Although the Swedish economy is still steaming ahead, the topics of immigration and crime have taken centre stage during the election period (Sweden goes to vote next Sunday 9 September) after the Scandinavian nation took in more asylum seekers relative to its population than almost any other European country and saw a crime wave unlike anything seen before in northern Europe. Recent polls show that the anti-immigrant Sweden Democrats could become the largest party after next weekend’s vote, which would send shockwaves through Europe. I am so surprised …. Socialists and Liberals lying to get votes. NOT! It seems to always be part of their campaign platform and after they normally lose then the whine, blame transference, Violence and Fake accusations . If they happen to win then it is full throttle reduce right, threaten opponents, confiscate and ban. they MUST lie because their agenda is to destroy Sweden by importing millions of violent welfare savages to their once beautiful, clean, crime-free country. The left always seems to be lying to gain votes.